(TibetanReview.net, Mar18, 2017) – More than 400 delegates from 30 countries are taking part in a three-day international Buddhist conclave inaugurated by Tibet’s exiled spiritual leader, the Dalai Lama, on Mar 17 at the sacred Buddhist cite of Rajgir, a city in Nalanda District of Bihar. 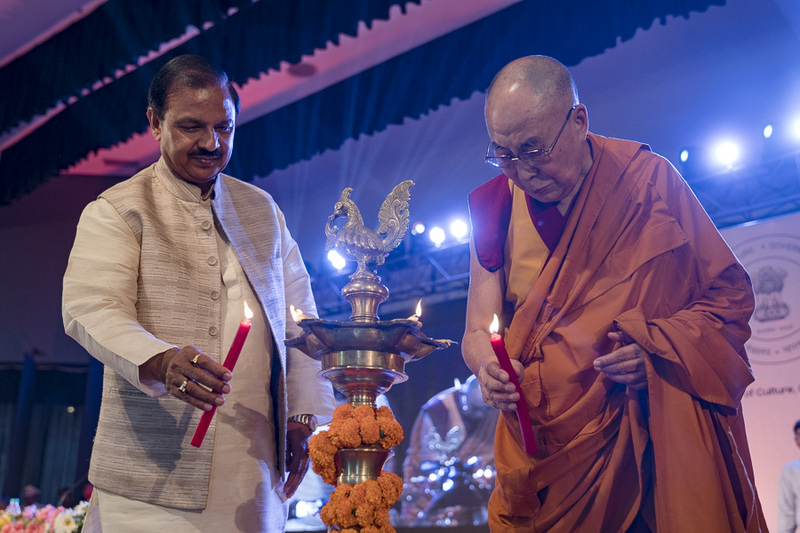 Dr Mahesh Sharma, India’s Minister of Culture, accompanied the Dalai Lama to the dais for the inaugural session. The Dalai Lama has described Tibetan Buddhism as one based on the Nalanda tradition, referring to the famous ancient Indian Buddhist university from the area. The conclave is being held in the Rajgir International Convention Centre (RICC) and is being jointly organised by Nava Nalanda Mahavihara (NNM) — a deemed university – and India’s Ministry of Culture. The theme of the conference is ‘International Conference on Buddhism in the 21st Century’. “This is for the first time in India that a Buddhist conclave is being organised on such a huge scale. Several technical sessions will be held where the participants will discuss various aspects of Buddhism and the teaching of Lord Buddha,” DNA news agency Mar 17 quoted NNM media in-charge Srikant Singh as saying. The Dalai Lama also released the 41-volume Pali Tripitaka reprinted by the Nav Nalanda University and inaugurated the University’s new department of Buddhist Science. Later in the afternoon the Dalai Lama participated in an open discussion of Buddhist leaders and sangha from various countries and traditions. There was a call from Buddhist scholars from Sri Lanka for more contacts between Tibetan Buddhism and Sri Lankan Universities. Other Buddhist leaders urged the need for a universal Buddhist scripture. The report said the participants in the conference had come from countries such as Singapore, Sri Lanka, Taiwan, Nepal, Cambodia, Malaysia, Indonesia, Hong Kong, Germany, Thailand, Bangladesh and Uganda. Prominent Tibetans attending the concalve include the Gyalwang Karmapa Rinpoche, Jangtse and Sharpa Choejeys, Kartok Gertse Rinpoche, Jonang Gyaltsab Rinpoche, Ngor Thartse Khen Rinpoche, Drigung Kyabgon Chetsang Rinpoche and representatives of the Bon School as well as Ven Karma Gelek Yuthok, the exile Tibetan minister for religion and culture. India’s President Pranab Mukherji is expected to attend the concluding ceremony of the conference.